Elizabeth concentrates her practice in the field of commercial litigation, and currently focuses on matters relating to commercial construction and real estate. Elizabeth frequently represents contractors and suppliers in pursuit and recovery of mechanics liens and bond claims on private and publicly funded projects, and has successfully recovered commissions due on contracts for commercial brokerage and property management services. For owners, she negotiates contract terms, advises on risk allocation and insurance, and also defends claims. Elizabeth's experience also includes corporate representation on matters of business governance, shareholder disputes, enforcement of restrictive employment covenants, and creditor's rights. She was retained as interim general counsel to a Midwest construction management company, has served on several boards of directors for not-for-profit entities, and currently assists with the representation of one of the largest publicly funded community service organizations in the nation. 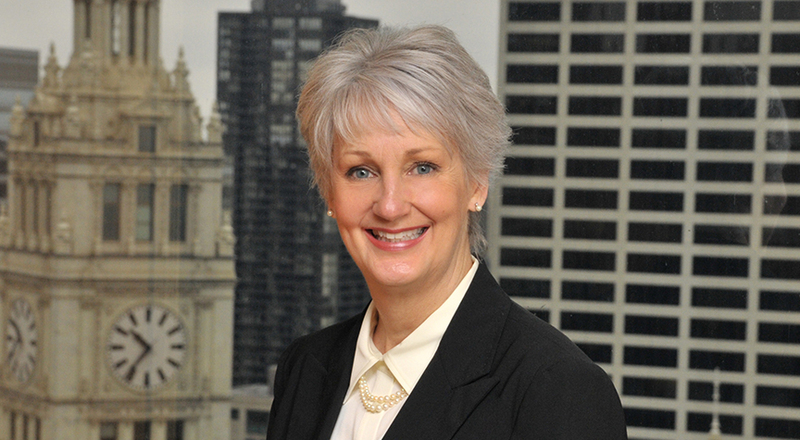 A seasoned advocate, Elizabeth has been the principal trial attorney in numerous cases including one of the longest running bench trials in the Circuit Court of Cook County, Illinois. She is well versed in matters requiring declaratory or injunctive relief and has prosecuted or defended appeals in both state and federal courts. Elizabeth regularly hears oral arguments for first year legal writing students attending the John Marshall Law School in Chicago, and serves as an evaluator for local mock trial competitions. Lead litigation counsel for a nationally recognized insurance company in pursuit of claims against a former agent for fraud, breach of contract and statutory violations arising from a scheme to procure unearned commissions. As lead counsel, Elizabeth planned, managed and directed litigation proceedings in the United States District Courts of Illinois and Florida, including the activities of local counsel. The case resulted in entry of judgment for the company in the high six figures, with leave to levy the defendant’s assets. Lead trial counsel for a nationally known contractor in dispute over hundreds of unpaid change orders on a Chicago building renovation project, resulting in judgment for the contractor and full recovery of the amount claimed, with interest. Represented one of the world’s largest commercial real estate services firms on a seven figure claim for unpaid commissions and fees, procuring full recovery against one of the largest and best-known properties in Chicago. Represents a large Midwestern supplier of building materials in various matters, including numerous mechanics lien claims resulting in collection of $500,000 over a two year period. Negotiated terms and conditions of a professional services agreement between a consulting engineering firm and a leading provider of energy services. Numerous engagements to negotiate terms and conditions of AIA form and non-form commercial construction contracts, with special attention to risk allocation and insurance requirements. Negotiated terms and conditions of agreement between owners and contractors for construction of several top tier private residences. Served as interim assistant general counsel to construction management and design-build services firm operating in domestic and international industrial/commercial sectors, advising on matters relating to private and publicly funded projects. Subcontractors: Do You Know What You Signed Up For? Mechanics Liens: Don’t Throw in the Kitchen Sink - Alternative Facts Won’t Get the Job Done.